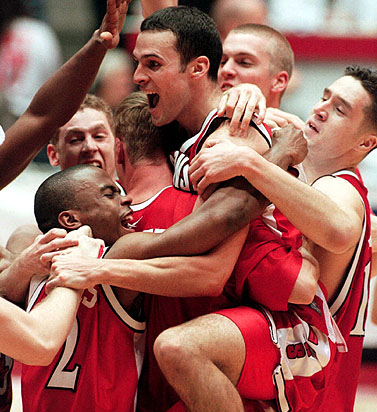 March Madness 2000, eighth seeded Wisconsin had already gone through Fresno State, upset first seed Arizona, and knocked off LSU to enter a matchup with conference rival Purdue in the Elite Eight. The Badgers had already beaten the Boilermakers twice in regular season play. Mike Kelley was a guard for the Badgers and knew his team had what it took to pull out a third win and reach the Final Four, a feat they hadn’t done in nearly six decades. After only a sixth place finish in the Big Ten that year, the Badgers surprised a lot of people. In fact, 40,000 fans watched as Kelley made two free throws in the final 10.6 seconds to beat Purdue 64-60 and advance. That was only the second time in school history Wisconsin made it to the Final Four. Shining Moments in Badger History is sponsored by Marshfield Clinic. It’s known as the Miracle on Ice. It was on February 22, during the medal round of the 1980 Winter Olympics in Lake Placid, New York. Team USA skated onto the ice against Russia, who had won gold medals in six of the seven previous Olympics and was heavily favored to take home another. The young USA squad included Badgers Bob Suter and Mark Johnson. Down 3-2 in the third Mark Johnson and Mike Eruzione both scored to give Team USA the 4-3 lead, enough to seal the win and stun the world. 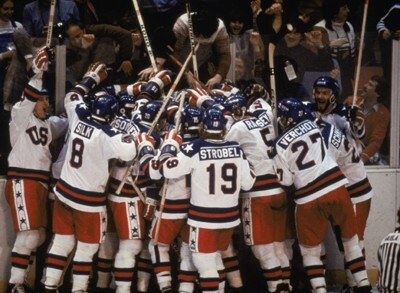 In what then was a round robin style of play, Team USA went on to beat Finland to secure the gold medal. Russia won silver by defeating Sweden. The game is widely regarded as one of the greatest sports moments of the 20th century. 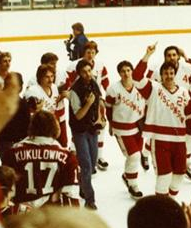 In the semifinals of the 1983 WCHA Playoffs, Wisconsin faced North Dakota in Fargo. Badger center John Johannson says it was a matchup he’ll never forget. Neither team scored until the third period when North Dakota jumped to a quick two to nothing lead. Chris Chelios would tie the game, sending it to the first of what would eventually be three overtimes. 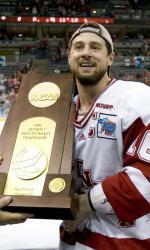 Three weeks later, Wisconsin went on to the win the NCAA Frozen Four. March 2, 1968. 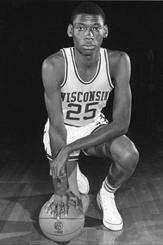 During Team Captain Joe Franklin’s final season at Wisconsin, the Purdue Boiler Makers traveled to Madison to take on the Badgers and Franklin pulled down a career high 27 rebounds in that game. It was nothing too surprising for a player who had become known for knowing exactly where the ball was going to be. Bill Scott talked to Franklin’s coach John Erickson, who remembers Franklin as a force. Franklin’s rebounds helped the Badgers secure a 104-84 win over the Boilermakers. He ended his collegiate basketball career one week later having accumulated 858 boards for what is still a school record at 11.9 rebounds a game. That year, Franklin was also chosen as a first team All-Big Ten selection after securing another school record with 544 points. Franklin went on to play for the Milwaukee Bucks. April 8, 2006. The Badgers skated onto Bradley Center ice with some much earned confidence. Wisconsin was at the end of a stellar season that included an outdoor game at Lambeau, a win against Ohio State and sweeps of North Dakota and biggest rival Minnesota, and the triple overtime game at Green Bay that sent the Badgers to the Frozen Four. All that stood in the way was Boston College. It was a tight game. The Eagles jumped out to an early lead. But the Badgers would battle back with Robbie Earl tying the game shortly into the second. Then at 9:32 into the third quarter, senior Tom Gilbert’s goal put the Badgers back on top where they would stay, beating Boston College 2-1 and earning their sixth national title and first since 1990. That year was etched into the history books for Wisconsin as the Badger women’s ice hockey team also took the 2006 NCAA Title. December 3, 2011. The Badgers headed to Lucas Oil Stadium in Indianapolis for the first ever Big Ten Championship game in the conference’s 115 year history. 15th ranked Wisconsin had met 11th ranked Michigan State once earlier in the season with the Spartans claiming victory on a last second “Hail Mary” pass play 37-31. The Badgers scored first, but the lead didn’t last and the Spartans managed to stay on top into the second half until just under four minutes to play. That’s when Badger quarterback Russell Wilson threw one up for grabs on 4th down and Jeff Duckworth came down with a 36-yard reception setting up Wisconsin’s game winning touchdown, a 7-yard run by Montee Ball with 3:45 left to play. 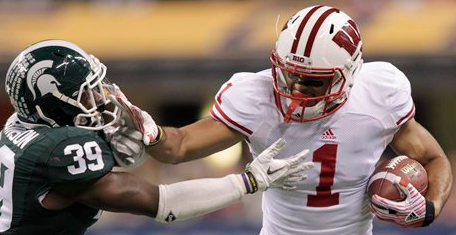 The 42-39 win earned the Badgers a birth in the 2012 Rose Bowl, the second of three straight appearances for Wisconsin. After Wisconsin men’s basketball won the national championship in 1941 the team struggled for decades. The program spent 42 years without a post season appearance and eked out fewer than 10 winning seasons. Then came former New York Knicks head coach Stu Jackson in 1992. Jackson implemented an up tempo offense earning Wisconsin it’s first top 25 ranking in 16 years. 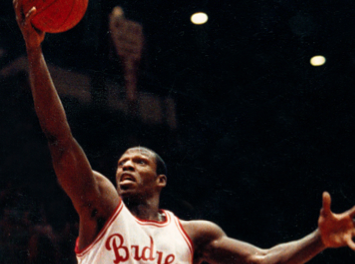 And in 1993, Jackson’s new look Badgers received Wisconsin’s first NCAA tournament bid in 47 years. Athletic Director Pat Richter hired Jackson, who had been one of the youngest coaches in NBA history, bringing new energy to Wisconsin. After Jackson’s success with the Badgers he returned to the NBA as general manager for the Vancouver Grizzlies. 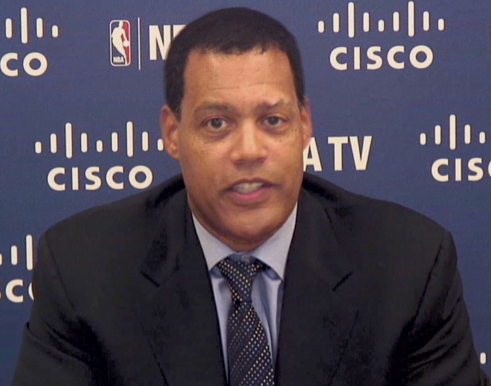 He was later named Executive Vice President of Basketball Operations for the NBA. December 3, 1988. The Wisconsin Badgers took a perfect 3-0 record into their game against in-state rival Marquette, in the championship game of the First Bank Classic. It was the first time the Badgers had played in the brand-new Bradley Center, and they made the most of it. Jones helped lead the Badgers past Maine in the tournament semifinals, then played a key role in the Badgers’ 70-55 win over Marquette in the championship game. Jones was named the tournament’s most valuable player. Later in the season, the two teams would meet again — this time in Madison — and the Badgers would come away with another win, 60-51. Detroit, 1990. The Wisconsin Badgers had just squeaked by Boston College in the national semifinals, 2-1. They faced off against Colgate in the title game in Detroit, as they looked to pick up their fifth national championship. Even before the puck was dropped, defenseman Mark Osiecki says the Badgers had a big advantage in the stands. “It was tremendous. I mean, it was 15,000 (fans) for Wisconsin. It was awesome,” he says. That fan support translated into the Badgers’ positive attitude on the ice. The Badgers blitzed the Red Raiders, jumping out to a 4-1 lead after one period. They ended up getting a hat trick from John Byce in a 7-3 victory. The team finished with a record of 36-9-1, racking up the second-most wins in school history. Despite all the wins, Oseicki says he takes something else away from that season. Shining Moments in Badger History are sponsored by Marshfield Clinic. Dec. 2, 2009. When Wisconsin and Duke met in the Big Ten/ACC Challenge in 2009, the Blue Devils were considered heavy favorites. They were a perfect 6-0, ranked 6th in the country, and they hadn’t lost in a Challenge game in ten previous seasons. That all began to change when Wisconsin grabbed a 19-9 lead to start the game. Guard Tim Jarmusz says the team was confident it could knock off the Blue Devils, especially after the fast start. Wisconsin went on to win the game 73-69, bringing its record to 5-1 and handing the Blue Devils their first loss of the year. Trevon Hughes led the Badgers with career high 26 points — 19 of them in the 2nd half. The win also ended Duke’s 10-game winning streak in the Big Ten/ACC Challenge, and avenged an 82-58 blowout by the Blue Devils just two seasons before. It was one of the high points of a very good season for the Badgers, who finished that year 24-9 and advanced to the 2nd round of the NCAA Tournament. Shining Moment in Badger History are sponsored by Marshfield Clinic.